Military and Settler Vandalism Escalates as Court Battle over South Hebron Hills Heats Up | The Only Democracy? We continue to follow, report and support the struggle of the Palestinian residents of the West Bank’s southernmost region, to continue living on their ancestral lands which they legally own. One would think that in an enlightened society such a simple request would be guaranteed beyond doubt. Unfortunately, the opposite is true. For an entire generation, the Occupation regime, aided and egged on by the settlers that regime has introduced into the region, has been trying to uproot a few thousand indigenous residents. The mechanisms have ranged from military edicts, bad-faith legalistic arguments in court, pressure on the ground, and naked violence and vandalism. On the court front, residents have last week achieved what seems like a minor victory. The Occupation regime now insists that “only” 8 Massafer-Yatta villages be evacuated and destroyed, instead of the 12 that the original 1999 edict declared to be part of an IDF “firing range”. According to lawyers who represent the residents, during the court battle the regime offered this reduction from 12 to 8 in exchange for stopping the struggle. Now the regime has been (apparently) forced to do so in exchange for nothing. The regime probably sees now that its flimsy – no, outrageous – arguments that it can declare a “firing range” over an entire stretch of populated land and pretend the people there have never existed, has very little chance of winning the day, even in the skewed playing field of Israel’s own courts. Therefore, it perhaps tries to appear more “rational” and “reasonable” by excluding 4 villages from the count. The High Court has responded by erasing the original 12-village petition, and inviting plaintiffs to resubmit an adjusted one for the 8 villages within several months, without any impact on their petition rights. 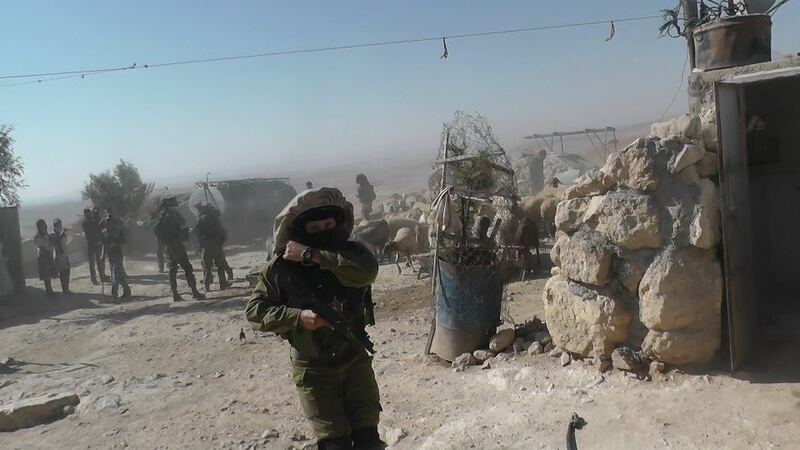 That victory noted, the IDF still controls the region very tightly, and has continued to try and inflict misery and intimidation upon residents, in the hope that they leave of their own accord. This summer’s campaign has started, as reported here, with sweeping evacuation and demolition decrees, in apparent violation of the pending court case. 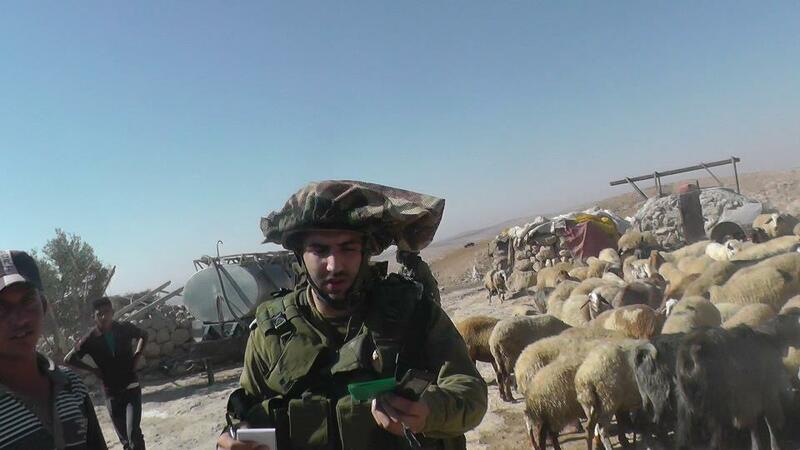 Now, during the first week of August the IDF raided two of the 4 villages removed from its evacuation edict! Then, on August 7 it raided Jinba village, which is among the 8 still included in the court case. Images of this “heroic” use of military might and resources against defenseless civilians, are below. 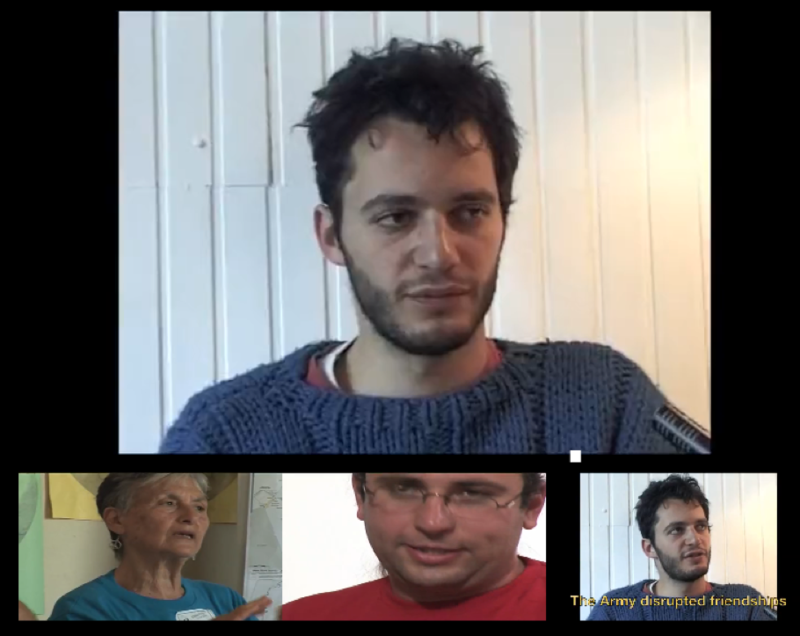 The pictures were taken in Jinba by Btselem activists, and transmitted to us by Guy Butavia. The raids were implemented using helicopters, which landed and took off in the village 6 times. Intimidation alone was not enough for the brave soldiers, so they also tossed out the contents of some closets, and spilled large jugs of milk and cream. Amira Hass reported this raid on Haaretz, but apparently that newspaper’s English mirror is now attempting again to charge a premium for reading the only somewhat-independent mainstream Israeli source for news on the Occupation. 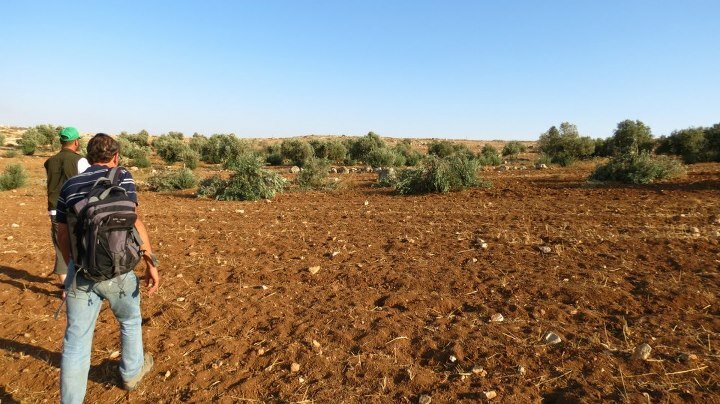 In the afternoon of August 16th some Palestinians discovered that an olive grove situated in Humra valley had been recently destroyed during the night, according to a Palestinian. 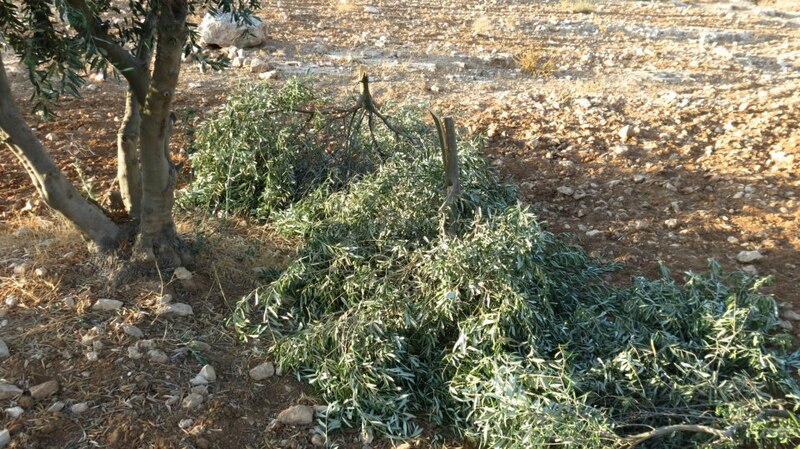 Thirty olive trees were broken or severely damaged. The olive grove belongs to a Palestinian family that lives in Yatta, a Palestinian town close to At-Tuwani. The area in which the olives trees were cut is located in front of Havat Ma’on, an illegal outpost. The amount of Palestinian trees tore down and damaged [in the region] since January 2012 rises to 97: a largest number is located in Humra valley. 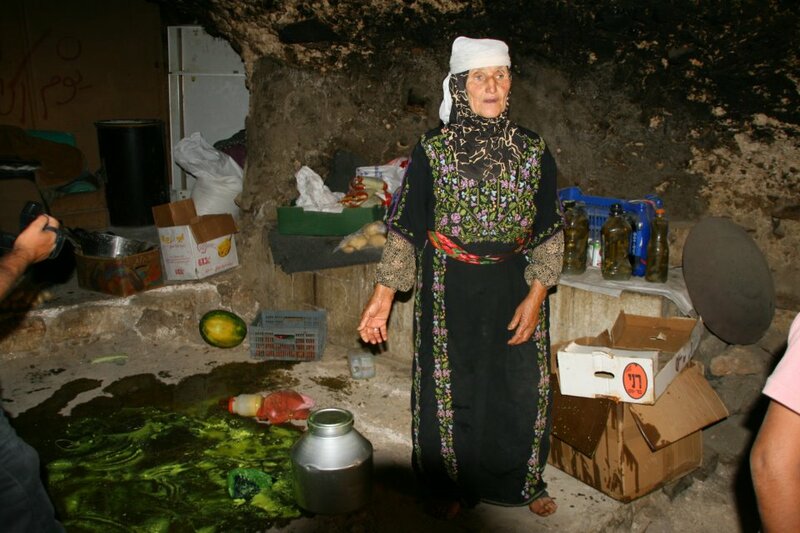 The olive grove’s destruction represents several problems of subsistence for Palestinians. 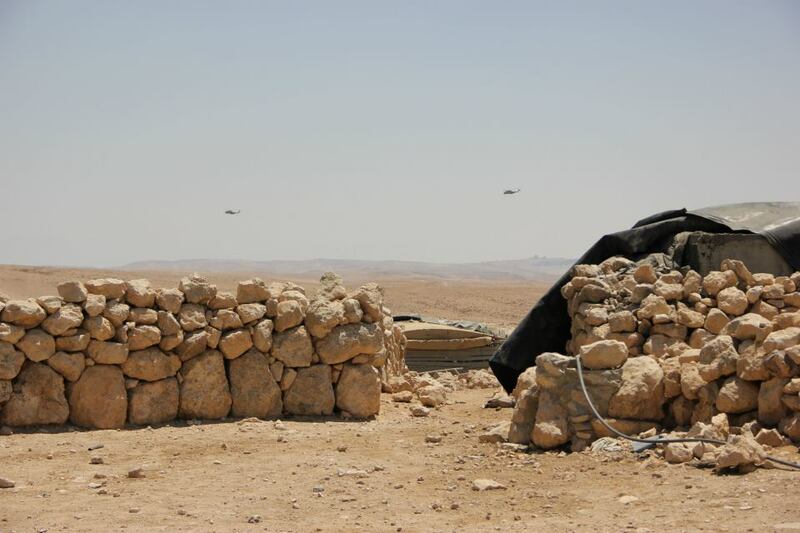 Operation Dove has maintained an international presence in At-Tuwani and South Hebron Hills since 2004. Once again, the settlers and the military Occupation prove in action that they are two arms of the same beast: the beast of nationalist supremacy, dispossession and violence. In addition, over the past few days the military has confiscated private Palestinian vehicles in the region, under the pretext of “unauthorized driving inside a firing range.” The Occupation makes a joke of the concept “issue pending court decision”, and uses its power on the ground to intimidate and forcibly drive people off their land. So far, the residents, aided by concerned citizens of Israel and around the world, have remained determined to stand up for their rights. More images from the two vandalism incidents can be found below (credit for both sets goes to Guy Butavia). 2 Responses to "Military and Settler Vandalism Escalates as Court Battle over South Hebron Hills Heats Up"